Even if you are only in Las Vegas for a day, try to see the Bellagio Fountains if you've managed to miss them on previous trips or if this is your first time in Las Vegas. The fountain show is magnificent, especially at night. 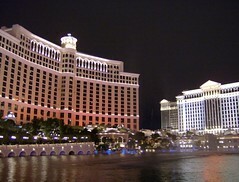 The huge fountains pool - more like a small lake - stands directly in front of the Magnificent Bellagio Hotel. "Nearby" are Ceasar's Palace and Paris Las Vegas, although "near" in Las Vegas can mean a 15 minute walk as the properties are almost unsurpassed in their size and scale.